主旨： RE: TELL ME HOW TO PROCEED ONLINE BANKING TRANSFER . 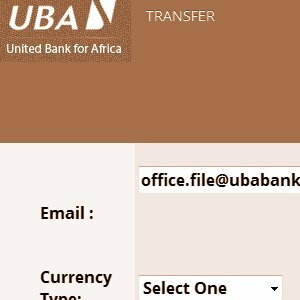 Director Online Operation Department United Bank Of Africa. However, your Personal Online Account was opened and modified as agreed with the officially of UN Online Monetary Dept/international monetary fund agency. All information's provided to you here must be total confidential, as the information's are important and not to be release to third party no matter the circumstances forsecurity of the account. Be advise to learn how to use the account online yourself no matter the kind of difficulties you are facing in learning, please learn it because we are not going to be hold responsible for lost of account information's. Please take note of your account details and your Personal Online Account link for you to go into your account online, this detail is very confidential especially the link to your account is quit personal, we advise you not to disclose this important information to anybody for your own good. Insert below online customer login access link into your computer web address bar and enter. You will be redirect to your account statement, where you can also perform online fund transfer to any bank account of your choice. Click transfer to access transfer, but your transfer will not get though until we receive payment for international online fund transfer code. However, online transfer activation CODE. . will be active when payment for activation is received. Be inform that activation fee is 100% refundable into beneficiary online account after 48 hours of activation which will enable you have confirmation of your online transfer from your online account, the activation fee amount to the tone of One Thousand Four Hundred and Forty united state dollars only (US$1440.00) only. As soon as we receive the fee for activation, we will issue your new transfer code that will enable you transfer fund online from your online account to any bank account of your choice. Account Number and password are case sensitive. Do not disclose your account login access to any third party. Our bank staffs will never request for your account login details and if any one request do not disclose it. we will not be liable for any theft of account information resulting from careless disclosure of account logins information by Customers. Send the required account activation fee to our activation account officer via Western Union money transfer to expedite the activation of your online transfer code. Here is the account activation officer information's. Send the activation fee with the officer information's above and confirm the receipt to me for immediate release of new online fund transfer confirmation code that will help you have successful transfer.